Do you floss your teeth daily? Many people do not take the time to floss their teeth on a day to day basis. Why? Every Dentist has heard the same reasons. There’s not enough time, or you didn’t realize the importance of making sure this was a part of your dental hygiene. If you don’t floss like you should, don’t worry you’re not alone. Almost 50% of people say that they do not make time to floss, and we believe that if everyone was informed on why it was so important to brush your teeth and floss, more people would incorporate flossing into their daily routine. Here are some benefits of flossing you might not be aware of. Flossing removes plaque. Plaque buildup leads to tartar, a hard substance that traps bacteria and is extremely difficult to remove. When you visit your dentist’s office, the scraping on your teeth is often your dental hygienist working to remove this awful bacteria. It’s best to avoid it entirely. Flossing can prevent tooth loss. When you don’t floss, it’s a lot easier to get gingivitis, a gum disease, from missing all of the areas that floss can reach for you. Gingivitis causes periodontal disease, the main cause for people losing their teeth. Flossing helps prevent heart disease. By flossing your teeth, you’re ridding yourself of harmful bacteria, which can overtime lead to heart disease and make people with weaker immune defense very sick. Flossing helps prevent bad breath. The number one cause of bad breath is bacteria. Brushing alone doesn’t remove all odor causing bacteria. Flossing reaches areas that you can’t clean properly with a toothbrush. Flossing saves you a lot of money. Flossing prevents tartar, which leads to cavities and gingivitis, which can cause gum disease. As you can see, there are many medical, hygienic, and economic reasons for flossing daily. Your smile will shine brighter, and you will feel better about yourself overall. 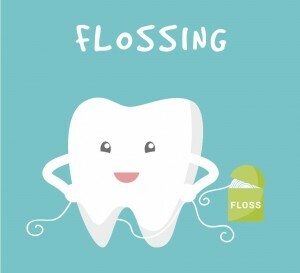 It’s never too late to add flossing to dental hygiene your routine!